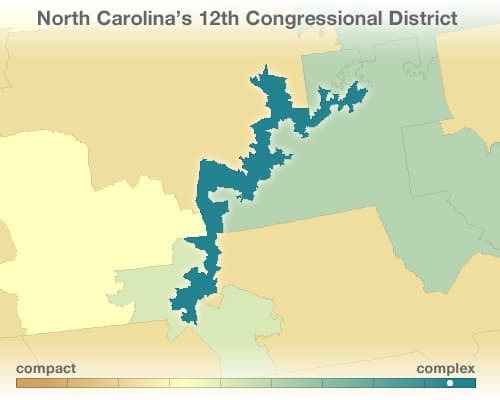 While gerrymandering of voting districts is an issue at the national level as discussed in the skit, it is also an issue in state and local elections. SCSJ is currently involved in litigation challenging unfair redistricting policies in a number of states including Texas, Florida, Tennessee, Georgia, and North Carolina. In SCSJ’s home state of North Carolina, considered the second most gerrymandered state in the U.S., SCSJ is about to take the issue of gerrymandering to the State Supreme Court. Oral Arguments will take place on January 6, 2014. SCSJ and other advocacy groups will fight to the end to ensure that voting districts are representative our our diverse populations without diluting or “packing” one racial group. Dilution is the practice of putting so few members of one voting group into a precinct that such a group would be unable to elect a candidate of choice. Packing refers to the practice of putting so many people of one group into a single district that it diminishes that group’s ability to elect candidates of choice in surrounding districts. SCSJ and other advocates are appealing a lower court ruling that “the redistricting plans enacted by the General Assembly in 2011 must be upheld and that the Enacted Plans do not impair the constitutional rights of the citizens of North Carolina as those rights are defined by law.” (Read the full Court Decision here.) At the January 6, 2014 oral arguments before the NC Supreme Court, SCSJ will represent nonpartisan clients including the NC NAACP, League of Women Voters of NC, A. Philip Randolph Institute, and Democracy NC, as well as numerous individual plaintiffs, in the upcoming oral arguments before the North Carolina Supreme Court.